When I met Pawan Agrawal just a couple of months ago, he was furiously campaigning for the Aam Aadmi (AAP) or “Common Man’s” Party ahead of Delhi’s legislative elections. Even at the peak of winter, Agrawal would wake up at 6 a.m. to begin his day, going around town with his friends, wooing voters. He did the toughest grassroots campaigning with ease: engaging strangers and readily convincing them that the AAP, even though it was a new experiment in politics, was the most democratic party in India. Agrawal, 26, had left his established career as an electrical engineer in the South Indian city of Hyderabad and joined the AAP. He hoped the new group would help bring order and transparency to India’s fractious politics. He saw the AAP as an alternative to the dynastic Congress party and the right-wing Bharatiya Janata Party (BJP). He was so devoted to the AAP that he would not entertain any argument against the party, which formed two years ago in a challenge to the existing political culture in Delhi. Today, Agrawal is distraught and just a shadow of his former self. 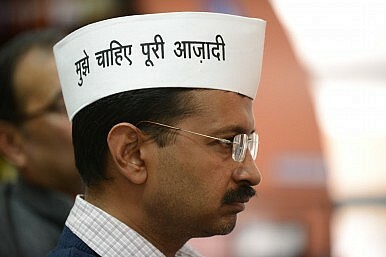 Barely two months after his party registered a historic victory in Delhi’s elections, its future looks bleak. Before sitting down to speak with me, he had repeatedly declined to be interviewed for this article. Many AAP supporters, promised a new form of politics, are feeling cheated and lost. Open infighting among the party’s elite is reaching a boiling point. On Sunday, at the national executive meeting of the party in Delhi, some of the most senior and respected members in the organization were sacked for questioning party leadership. The leaders who face expulsion from the party, including Prashant Bhushan, Yogendra Yadav, and Anand Kumar, were among the founding members of AAP two years ago. The dissenters were not happy with the party’s conduct in February’s elections, fearing that Arvind Kejriwal, the AAP’s leader, compromised the party’s principles by putting corrupt and dubious candidates on the ticket. They’re also unnerved about where the party’s funding was coming from. Kejriwal saw that dissent as a challenge to his leadership. According to reports, the rebel leaders were not allowed to express their views at Sunday’s meeting. Some say they were booed by Kejriwal’s supporters and unilaterally tossed from the highest decision-making body of the party. The manner in which the meeting was conducted sent shock waves through the party’s faithful. The AAP’s platform captured the imagination of Indians for its promise to root out corruption, and instill some much-needed transparency to Delhi politics. But Sunday’s development knocks the party off its high moral pedestal. In just a few months, the AAP has come to face the same ills that plague the Congress party and the BJP. The party is slowly morphing into another typical Indian party. With every compromise made on its founding principles, the AAP betrays its original backers, the youth and civil society movements who were disillusioned with the hitherto existing political parties. The AAP owed its success to the promise of change that it carried; to give up on this promise is to admit political defeat for the sake of electoral victory. Agrawal is filled with a similar sense of remorse. “What a waste,” he says. “I had such high hopes for the AAP. I took a huge risk by leaving my job. The developments within the AAP have left me despondent.” Agrawal plans to leave Delhi very soon. Who to blame for this state of affairs? Arvind Kejriwal, in his address to the national council, blamed Bhushan and Yadav for the crisis. In his speech to the assembly, released to media a day later, he alleges that the duo conspired against the party during the Delhi elections. However, most political analysts hold Kejriwal responsible for the problems in the organization. …the AAP is a form of sole proprietorship, not the political cooperative that many thought it was. The faux collegiality of the AAP’s early days… persuaded many that the AAP’s rhetoric of decentralized democracy applied to the party’s organization. This latest assertion of Arvind Kejriwal’s ownership of the party has helped clarify that confusion. It is clear that he (Kejriwal) is no democrat, neither is he someone who has much faith in a consultative process, these convenient fictions have already served his end in the party. Now that the fig leaf of principles has been shed along with Bhushan and Yadav, he will no longer be seen as a politician who stood apart. He has taken his place among the other political figures in this country who are also largely motivated by their desire for power. The only question that now remains is, what, if anything, does Kejriwal stand for, apart from himself? Supporters have started questioning the very idea of the party. News reports suggest that the dissenters are planning to form another political party to keep the spirit of the AAP alive. However, does the AAP have a future? Many compare the AAP with the Janata Party experiment in 1970s. It began when a group of small parties gathered together under the leadership of Jayaprakash Narayan, a socialist, to contest the ruling Congress party. The alliance challenged the corrupt practices of the ruling party and the concerted campaign brought a new energy and idealism in the country that led to the first ever defeat of the Indian National Congress. However, within two years the experiment failed, owing to the personal ambition and inherent political contradictions of the membership of the Janata Party. Does the same fate await the AAP? The party lacks a coherent ideology and any long-term program. Anti-corruption slogans alone cannot take the organization far. Over the last couple of weeks, internal bickering has cost the party its very image. The AAP might survive as a political party in Delhi. But the idea of the AAP is dying. Changes at the Top Levels of Government in DelhiIndia's Anti-Corruption Warriors Are Losing SteamDelhi Chooses the 'Common Man'India’s Smart New ElectorateKejriwal Resigns In New Delhi: What Next For the AAP?